Dr. John Doyle, M.D answers questions Jehovah’s Witnesses want to ask. QUESTION: These blood components allowed by the WTS, aren’t really blood, are they? ANSWER: They are derived from fractionating blood, and so are blood products by definition. QUESTION: Aren’t there always alternatives to blood? ANSWER: Very often there is. A patient with a high blood count (hemoglobin concentration) can sometimes tolerate large blood losses as long as the remaining blood is diluted with appropriate saline or other “balanced salt solution” so that the amount of circulating blood volume is still approximately the same. Of course, the diluted blood cannot carry oxygen as well as it did earlier. But once the hemoglobin concentration falls below 6 g/dl (severe anemia) the risk of organ injury or death from oxygen deprivation rises to the point that few physicians would ordinarily withhold blood. For example, in one study of Witness surgical patients who needed but refused blood transfusion, over 60% of those with a hemoglobin concentration under 6 g/dl died (full data are given on one of my Web pages). By the way, efforts to make true blood substitutes that carry oxygen (salt solutions do not carry significant amounts of oxygen) are in progress. These substitutes are made from discarded human blood, and should be available in 5-10 years if all goes well. QUESTION: Doesn’t blood kill more people than it saves? What about AIDS and all of the diseases that blood carries? ANSWER: We all know that blood transfusions are not risk free. Indeed, nor are the drugs used to treat diseases entirely risk-free. Even latex surgical gloves can cause a severe allergic reaction in some individuals! (One of my patients almost died from this during routine gynecologic surgery – fortunately we recognized the problem and she responded to epinephrine). The whole bloodless surgery movement, which I enthusiastically support (see my Web pages on the topic), is aimed at reducing potential complications from blood transfusions. As a result of the AIDS and hepatitis scare in the 1980’s, physicians have thoroughly revised their thinking about when blood transfusions are appropriate (see more of my Web pages for sample transfusion guidelines). This fact, coupled with the availability of new tests for blood-borne pathogens (see earlier question), puts the benefit to risk ratio for blood transfusions at an all-time high. In my opinion the ratio of lives saved to lives lost from blood transfusions is now likely many thousand to one. QUESTION:The Witnesses who died after refusing a blood transfusion would have probably died anyway. Blood doesn’t save lives, does it? ANSWER: In some cases of severe injury (terminal cancer, 95% burns, smashed-in head, for instance) transfusing blood to optimum levels may only increase the chance of survival modestly. In other cases where there is no concurrent problem besides the severe anemia (bleeding from an ulcer that has been surgically fixed, bleeding from a cut artery, for instance) blood transfusions may be genuinely life-saving. The benefits of blood transfusions depend strongly on the clinical context. QUESTION: Do doctors want to use blood to cover up sloppy surgical technique? ANSWER: Surgeons, like lawyers, car mechanics, teachers and golf pros all vary in capabilities. As an anesthesiologist, I have noted wide variations in the skills of surgeons in reducing blood loss. Many hospitals have an audit process to let surgeons know when their patients consistently require more blood than average. Still, some surgical procedures (radical prostatectomy, craniofacial surgery, spinal surgery, for example) are associated with large blood losses even in the best of hands. Even then, predonation (“autologous transfusions”) can sometimes be used to reduce the risk of disease transmission. However, in the final analysis, patients cared for by surgeons that are sloppy about hemostasis (the prevention of surgical bleeding) will, on average, require more blood transfusions than those cared for by meticulous surgeons. QUESTION: Do Doctors make more money by ordering a blood transfusion? ANSWER: No. At least not in Canada. QUESTION: Doctors have substitutes for blood that work just as well, don’t they? ANSWER: No, not in terms of oxygen transport to organs. This situation may change in 5-10 years, however, with synthetic blood made from discarded human blood. QUESTION: I read that blood transfusions have lots of complications, especially if someone has cancer. This proves that they are bad medicine, doesn’t it? ANSWER: I have written about the complications of blood transfusion in one of my Web pages, but these complications do not make blood transfusions to be “bad” medicine any more than the fact that general anesthesia or antibiotics have potential complications makes them “bad” treatments. QUESTION: Doctors are unknowingly being used by Satan to test my faith. In times past they used to believe that taking blood out of a person was the best way to treat them. Now they want to transfuse blood from another person into them. Why should I believe them? ANSWER: A good doctor will take the time to explain why a transfusion is, in their opinion, necessary. If you think your doctor is the agent of Satan, he or she would likely not be upset if you sought out another doctor instead. 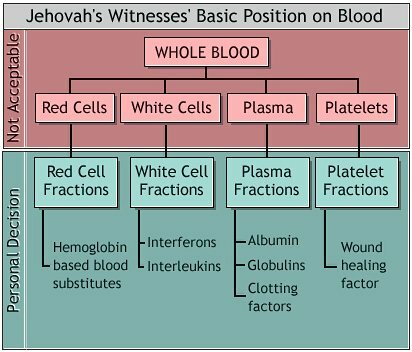 QUESTION: What the Bible and the Society have to say about blood is more important, and accurate than what doctors believe about blood, isn’t it? ANSWER: More important, possibly. More accurate, unlikely. QUESTION: Isn’t it true that red blood cells don’t carry oxygen for the first 48 hours or so in an emergency because its foreign blood. ANSWER: That is complete nonsense. The red cells begin transporting oxygen immediately. QUESTION: What tests are applied to donated blood to protect against transmitting blood-borne pathogens? Blood testing in the USA and the rest of the Western world is similar. QUESTION: How likely is it that a blood unit intended for transfusion is tainted? ANSWER: In an article in the Tortonto Star (November 28, 1997, p. A6) the following information was reported. The data is Canadian. One unit of blood out of every 913,000 is now tainted with HIV, the AIDS virus. For hepatitis C, one unit in every 103,000 is likely tainted. For hepatitis B, it is one unit in 60,000. Repetitive postings or comments deemed to be spam. Do not post the same comment to another article or post. Comments that are not relevant to the post topic, or comments that condone or propose illegal activity, or that breach copyright law. Comments that include profanity, language or concepts that could be deemed offensive. Comments that attack a person individually. Comments in languages other than English should be brief OR translated into English using Google Translate. Comments that are Evangelical in nature, or link to third party websites that are religious in nature. AJWRB reserves the right to make editorial decisions regarding submitted comments, including but not limited to removal of comments. All comments are moderated, so please be patient in waiting to see your comment posted. Thank you for observing our comment policy.